When Christ was transfigured, appearing in radiant glory with Moses and Elijah, the disciples wanted to build booths for them. When we build churches today, such as the strikingly transcendent interior of the Cathedral of Christ the Light, are we trying to "build a booth" to contain God? Or are we transformed ourselves when worshiping in a church of great beauty? The Cathedral, located on the shores of Lake Merritt in Oakland, is designed with the symbolic representation of Jesus Christ at its core. The 58-foot high image within the Omega window (pictured here) is created by natural light passing through aluminum panels that have been pierced with 94,000 holes. This image is a depiction of Christ in Majesty, borrowed from the sculpture of Christ in the central doorway of the west entrance to Chartres Cathedral in France. The use of natural light in the Oakland Cathedral symbolizes the movement of salvation history, climaxing with the tangible, powerful, presence of Christ. 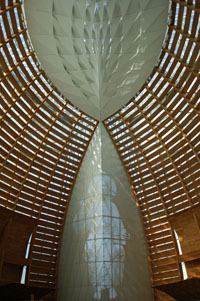 As the sun moves across the sky, the movement of light transforms the worship space. The intentional design of this sanctuary, active in its beauty and its theological meaning, reveals the reciprocal exchange of love between God and humanity. As humans, we offer our humble devotion, and God's presence is strongly felt. In a place of such beauty, natural and human-made, there are possibilities of transformation -- transformation and devotion are brought to life in an exchange of heavenly and earthly love. Adult Formation Committee, Cathedral of Christ the Light. Hartman, Craig W.. Cathedral of Christ the Light, from Art in the Christian Tradition, a project of the Vanderbilt Divinity Library, Nashville, TN. http://diglib.library.vanderbilt.edu/act-imagelink.pl?RC=54202 [retrieved April 26, 2019]. Original source: http://www.flickr.com/photos/sicarr/3251258111/.